Artwork Panel: 33.4cm x 67cm ≈ 13" x 26¼"
Silk/Brocade: 42.3cm x 139cm ≈ 16¾" x 54¾"
Width at Wooden Knobs: 51.3cm ≈ 20¼"
Reason for discount: A crack in one of the wooden knobs. The artwork is perfect, so hand as is, or cut out the artwork and frame it. 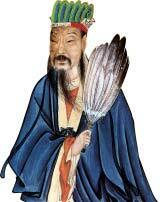 This is a kind of complex ten-character proverb composed by Zhuge Liang about 1800 years ago. The proverb means "Leading a simple life will yield a clear mind, and having inner peace will help you see far (into the world)". The last word means "far", but the deeper meaning is that you will surpass what you can currently see or understand. Perhaps even the idea of opening up vast knowledge and understanding of complex ideas. 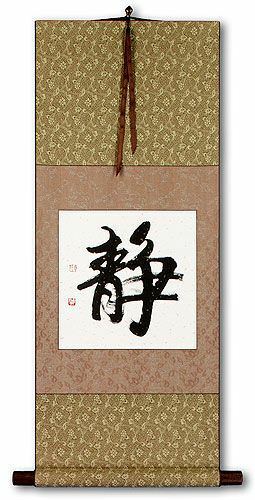 Written by Master Calligrapher Xing An-Ping using Chinese ink on handmade tan paper with gold flakes, and mounted to a handmade silk brocade wall scroll. 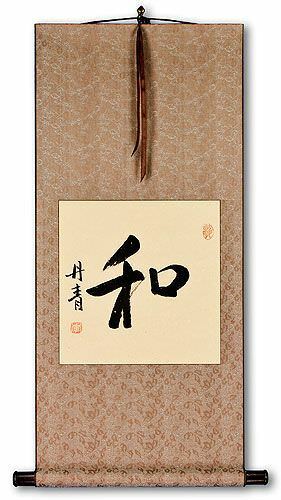 The style of these characters is "Kaishu" (regular script).